Women these days are under a lot of pressure to measure up in the eyes of the world. They are expected to have Pinterest-perfect homes, Facebook-brag-worthy children, Instagram-ready makeup and hair and so much more. Many feel constantly scrutinized by the people around them and even by other women! A Mary Vs Marth retreat can be a useful tool in helping women understand what God desires most from them: their attentive obedience. 38 While they were traveling, He entered a village, and a woman named Martha welcomed Him into her home. 39 She had a sister named Mary, who also sat at the Lord’s feet and was listening to what He said. Mary and Martha were obviously both excited and honored to have Jesus in their home. Martha no doubt wanted to make a good impression, so she set about cooking up a wonderful meal. Mary, on the other hand, just sat and listened to Jesus speak. He had her full attention. She wasn’t worried about putting out an impressive spread. She simply wanted to listen and learn. Jesus’ response shows a great deal of compassion and understanding for both women. He acknowledged Martha’s industry and Mary’s rapt attention. Martha was falling over herself to make a good impression when all she needed was to fall at Jesus’ feet like her sister did and listen to his words. Jesus was gentle in his rebuke, but made his point; it’s not what we do with our hands that means the most to him, it’s the condition of our hearts. Prayer and Bible study are vital components in the life of a believer. For busy women, this fun journal is a great way to keep up with prayer requests, thoughts and inspiration. Supply each lady with an expensive three-ring binder, some plastic dividers, notebook/sketch/graph paper and paint pens or markers. Allow the ladies to decorate the outside of the journals with stickers, washi tape or anything else handy. They can set up their journals in whichever way works best for them so that they are truly customized! This craft is incredibly versatile which makes it a perfect fit for any age group or skill level. Simply supply lots of colored ribbons and a variety of beads and charms. You can even supply lettered beads so your attendees can personalize their bookmarks with their names or an inspirational word (ex. HOPE, LOVE, JESUS). Follow the instructions in the link for cutting the ribbon length and threading the beads and give the ladies in attendance full freedom to make the bookmarks unique and special. As believers we are expected to know what the Word of God says and be able to readily quote scripture passages. Memorizing long verses can be tedious and difficult without a system. This craft provides an easy way for busy ladies to not only memorize scripture, but apply those scriptures in their daily lives. A small two-ring indel binder or card box should be given to each lady which they can personalize and/or decorate. Verses can be written on the index card. Follow the directions in the link for labeling the flip-side of the cards to keep track of daily, weekly, and monthly readings. By tracking their progress in memorization, the ladies are much more likely to be successful in their efforts to learn and apply the scriptures. This is a fun icebreaker game to play with your group. Hand out copies of the list provided in the link as the ladies come in. They should each look for the items listed in their purses, putting a check by each one they have. The lady with the most checks on their list wins a small prize. For this game, set up a small course using tape or tables. Divide your group into even teams and give each team a broom and a small ball. The teams must get the balls through the course (one person at a time) using only the broom. The first team to get all their members through the course wins. You can make this even more challenging by using a golf balls and pool noodles instead of brooms. Test your ladies’ Bible knowledge using the questions in the link or make up your own difficult Bible quiz. You can divide the group up and play in teams or play Jeopardy still with individuals. Award prizes to the players or team with the sharpest Bible proficiency. This can be a nice activity to do before the official beginning of your retreat. Set up a table in the entry with a variety of rocks and a plenty of colored permanent markers. Instruct the ladies to write down a favorite verse on a rock (just the book, chapter and number(s) not the whole verse.) At some point in the retreat have the ladies go up to the table, pick a rock and look up the scripture. They can share the passage aloud or just write in their memorization binders. This take-home activity is a great way to finish up your retreat and set your ladies up with a means of keeping up with all their new devotional material. Provide pretty baskets, boxes or crates for the ladies to put their Prayer Journals, Bookmarks and Scripture Binders in. Add in some pretty pens, pencils, tabs and stickers as well as a small devotional book or commentary to complete the baskets. Your ladies now have a ready arsenal of supplies to make the devotional time easy and enjoyable! Women can often feel overwhelmed by the demands of family and work, not to mention the expectations of society. 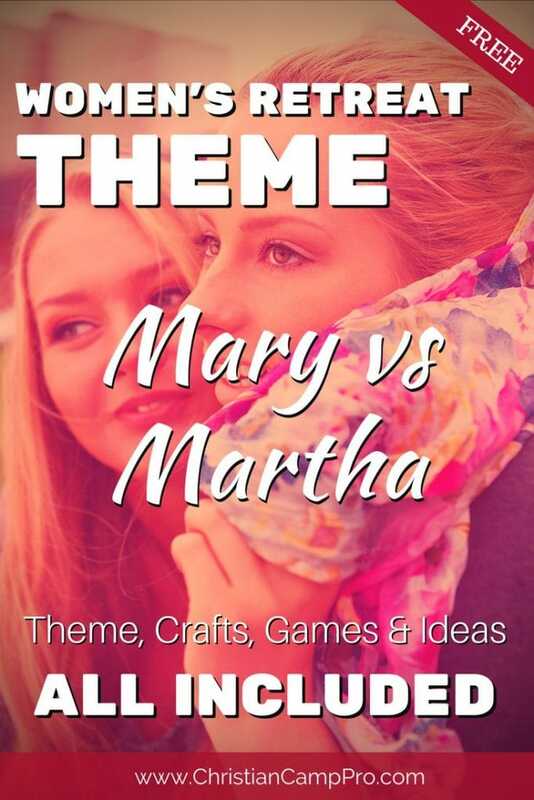 A Mary Vs Martha themed retreat can be an effective means of teaching women about what is most important to God. While it’s great to have a tidy house and meals that could grace the cover of a magazine, it’s more pleasing to Him to have a heart that seeks Him above all else.